A clean install is often the best way to solve very serious Windows 7 problems, like a virus infection you can't get rid of completely or maybe some kind of Windows issue that you can't seem to solve with normal troubleshooting. The steps and screen shots shown in these steps refer specifically to Windows 7 Ultimate edition but will also serve perfectly well as a guide to reinstalling any Windows 7 edition you may have, including Windows 7 Professional or Windows 7 Home Premium. Microsoft has changed the clean install process for every new Windows release. If you're using Windows 10, 8, Vista, etc., see How Do I Perform a Clean Installation of Windows? for links to specific instructions for your version of Windows. Finding the Windows 7 Product Key. If Windows originally came preinstalled on your computer (i.e. you did not install it yourself), your product key is probably located on a sticker attached to the side, back, or bottom of your computer's case. This is the product key you should use when installing Windows 7. Windows 7 Clean Install - Step 2 of 34. To begin the Windows 7 clean install process, you'll need to boot from the Windows 7 DVD if you're using a Windows 7 DVD, or boot from a USB device if your Windows 7 installation files are located on a flash drive or other external USB drive. See our Windows Installation FAQ if you have Windows 7 as an ISO image that you need on a flash drive or disc, or a Windows 7 DVD you need on a flash drive. If your existing Windows installation begins to boot or you see a "No Operating System Found" or "NTLDR is Missing" error here instead of the screen above, the most probable reason is that your computer is not set up to boot first from the correct source. To correct this problem, you'll need to change the boot order in BIOS to list the CD/DVD/BD drive, or External Device, first. It's perfectly fine if, instead of the screen above, the Windows 7 setup process begins automatically (see the next step). If this happens, consider this step complete and move on! Windows 7 Clean Install - Step 3 of 34. You don't need to do anything at this point but wait for Windows 7 to finishing loading files in preparation for the setup process. No changes are being made to your computer at this time. Windows 7 is just temporarily "loading files" into memory for the setup process. You'll be removing everything on your computer as part of the Windows 7 clean install in a future step. Windows 7 Clean Install - Step 4 of 34. After the Windows 7 install files are loaded into memory, you'll see the Windows 7 splash screen, indicating that the setup process is about to begin. You don't need to do anything at this point either. Windows 7 Clean Install - Step 5 of 34. Choose the Language to install, Time and currency format, and Keyboard or input method that you'd like to use in your new Windows 7 installation. Windows 7 Clean Install - Step 6 of 34. Click on the Install now button in the center of the screen, under the Windows 7 logo. Do not click the Repair your computer link at the bottom of the window even if you're completing this clean install of Windows 7 as part of some larger repair project for your computer. If you're performing a clean install of Windows 7 as a solution to a major problem but have not yet tried a Startup Repair, do that first. It could save you the trouble of completing this clean install process. Windows 7 Clean Install - Step 7 of 34. No need to press any keys here–everything is automatic. Windows 7 Clean Install - Step 8 of 34. The next screen that appears is a textbox containing the Windows 7 Software License. Read through the agreement, check the I accept the license terms checkbox under the agreement text, and then click Next to confirm that you agree with the terms. You should always read "small print" especially when it comes to operating systems and other software. Most programs, Windows 7 included, have legally binding limits on how many computers the application can be installed on, among other limitations. You are not breaking any laws or contracts by reinstalling Windows 7 via this clean install. As long as this particular copy of Windows 7 is only being operated on one computer, you're OK.
Windows 7 Clean Install - Step 9 of 34. In the Which type of installation do you want? window that appears next, you're offered the choice of Upgrade and Custom (advanced). Even if you are upgrading from a previous operating system to Windows 7, I highly recommend that you do not follow the Upgrade installation. You'll get better performance with less chance of issues if you follow these clean install steps. Windows 7 Clean Install - Step 10 of 34. In this screen, you'll see each partition that Windows 7 recognizes. Since a clean install involves the removal of all operating system related partitions, if they exist, we'll do this now. If, and only if, you're installing Windows 7 on a new hard drive, which of course does not have an operating system on it to remove, you can skip directly to Step 15! Windows 7 setup considers partition management as an advanced task, so you'll need to click the Drive options (advanced) link to make those options available. In the next few steps, you'll delete the partitions containing the operating system you're replacing with Windows 7, be it Windows Vista, Windows XP, a previous installation of Windows 7, etc. Windows 7 Clean Install - Step 11 of 34. Before continuing, please be aware that deleting a partition will permanently erase all data from that drive. By all data I mean the operating system that's installed, all programs, all data saved by those programs, all music, all video, all documents, etc. that might be on that particular drive. Your list of partitions may differ considerably from mine shown above. On my computer, I am performing a clean install of Windows 7 on a computer with a small 30 GB hard drive that has previously had Windows 7 installed. Windows 7 Clean Install - Step 12 of 34. The message says "The partition might contain recovery files, system files, or important software from your computer manufacturer. If you delete this partition, any data stored on it will be lost." As I spelled out in the last step, please be aware that all the data stored on that drive will be lost. If you have not backed up everything you want to keep, click Cancel, end the Windows 7 clean install process, restart your computer to boot back into whatever operating system you have installed, and back up everything you want to keep. To be clear: This is the point of no return! There's no reason to be scared, I just want it to be very clear that you can't undo the deletion of the drive you selected after you click this OK button. Windows 7 Clean Install - Step 13 of 34. For example, the Windows 7 installation I had on my PC previously created this special 100 MB (very small) partition to store system data in. This is most definitely related to the operating system that I'm trying to completely remove from my computer, so I'll delete this as well. As you can see, the partition we deleted in the last step is gone. It may appear like it's still there but if you look closely, you'll see that that same 29.9 GB space is now described as Unallocated Space, not as a partition. Windows 7 Clean Install - Step 14 of 34. Just as before, please be aware that all the data stored on this particular drive will be lost. Windows 7 Clean Install - Step 15 of 34. The number of partitions displayed and whether those partitions are unallocated portions of a hard drive, previously partitioned spaces, or previously formatted and blank partitions, will depend on your specific system and which partitions you deleted in the last several steps. If you're installing Windows 7 on a computer with a single hard drive on which you've just deleted all the partitions from, your screen should look like the one above, aside from your hard drive being a different size. You do not need to manually create a new partition nor are you required to manually format a new partition. Windows 7 Setup will do this automatically. Clean Install Windows 7 - Step 16 of 34. Windows 7 Setup will now install a clean copy of Windows 7 to the location you chose in the previous step. You don't need to do anything here but wait. Windows 7 Clean Install - Step 17 of 34. If you do nothing, your computer will reset automatically after 10 seconds or so. If you'd rather not wait, you can click the Restart now button at the bottom of the Windows needs to restart to continue screen. Windows 7 Clean Install - Step 18 of 34. You don't need to do anything here. There are a few more automatic Windows 7 setup steps to come. Windows 7 Clean Install - Step 19 of 34. Windows 7 Clean Install - Step 20 of 34. 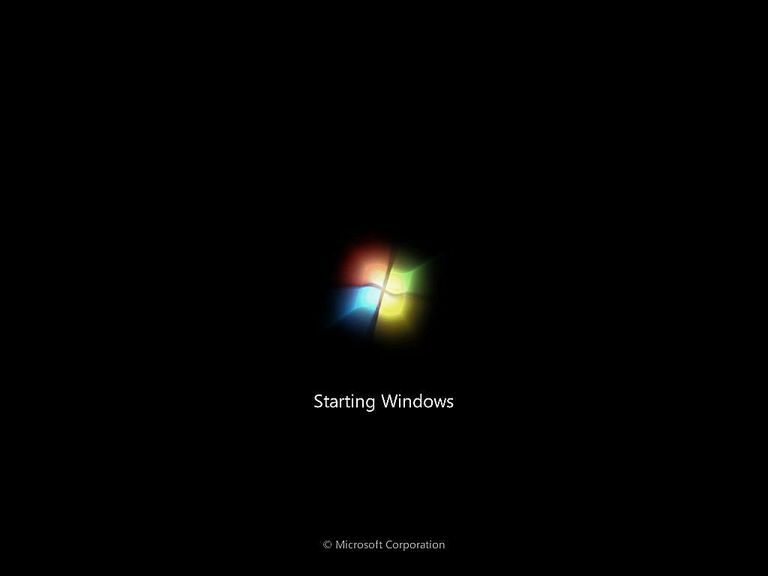 This starting of services will occur during every Windows 7 boot as well but you won't see it like this again. Services start in the background during a normal Windows 7 startup. Windows 7 Clean Install - Step 21 of 34. This last Windows 7 Setup screen says "Completing installation" and may take several minutes. All you need to do is wait–everything is automatic. The remainder of the steps in this clean install process include several easy but important configurations that need to take place before you can use Windows 7. Windows 7 Clean Install - Step 22 of 34. Do not restart your computer manually at this point. Windows 7 Setup will restart your PC for you. If you interrupt the setup process by restarting manually, the clean install process may fail. You may then need to start the Windows 7 setup over again from the beginning. Windows 7 Clean Install - Step 23 of 34. Windows 7 Clean Install - Step 24 of 34. Windows 7 Setup is now preparing your computer for "first use." Windows 7 is now loading drivers, checking to make sure everything has been setup properly, removing temporary files, etc. You don't need to do anything here. Remember, this clean install of Windows 7 has completely removed your old operating system. Windows 7 is being installed and configured just as it would on a brand new computer. Windows 7 Clean Install - Step 25 of 34. Windows 7 Clean Install - Step 26 of 34. Windows 7 needs to know what user name you'd like to use and how you'd like your computer to be identified on your local network. In the Type a user name (for example, John): text box, enter your name. You can enter a single name, your first and last name, or any other identifiable text you like. This is the name you'll be identified by in Windows 7. You're more than welcome to use the same user name that you used in your old operating system installation. If it makes sense in your specific situation, I recommend using the same computer name you used in the operating system installation you've deleted as part of this clean install, especially if any other computers on your network connect to resources on your PC. Click Next when you're done entering both the user name and computer name. Planning on having more than one user on your computer? Don't worry–you can set up more users inside Windows 7 later. Windows 7 Clean Install - Step 27 of 34. Don't treat this as a recommendation–consider it a requirement. In the Type a password (recommended): text box, enter a complicated but easy-for-YOU-to-remember password. Retype the same password in the Retype your password: text box. As you can see in the example above, the hint I entered was What is my favorite food?. The password I entered (which you can't see above) was applesauce. Feel free to use the same password as you used in the operating system you've just removed from your computer as part of this Windows 7 clean install. However, this is as good a time as any to choose a stronger password than you might have used before. Windows 7 Clean Install - Step 28 of 34. If Windows originally came preinstalled on your computer, your product key is probably located on a sticker attached to the side, back, or bottom of your computer's case. You may be able to avoid entering a product key at this point but you will eventually need to do so in order to continue using Windows 7. I highly advise that you enter your product key here and choose to Automatically activate Windows when I'm online. Windows 7 Clean Install - Step 29 of 34. On this Help protect your computer and improve Windows automatically screen, Windows 7 is asking you to choose how you want to automatically install updates from Microsoft's Windows Update service. I recommend that you choose Install important updates only. This option is the safest because it restricts Windows 7 from doing anything with your data or to your computer automatically except when important security and stability updates are available. You are more than welcome to choose Use recommended settings but I do not recommend that you choose Ask me later. These settings can easily be changed within Windows 7 after you're done stepping through these configuration questions. Windows 7 Clean Install - Step 30 of 34. The time and date is likely already correct but be sure to verify the time zone and change if necessary. If the date and/or time of Daylight Saving Time changes, Microsoft will issue an update via Windows Update to change the automatic time change, so don't avoid checking this box assuming that DST changes won't occur correctly. Windows 7 Clean Install - Step 31 of 34. In the Select your computer's current location window you see now, Windows 7 is asking where your computer is located at so it can set up the proper network security–tighter security for public areas and lighter for private ones like home and work. Choose Public network if you use a mobile computer and you connect to the internet or other computers away from home. Also, be sure to choose Public network if you access the internet via a mobile broadband network–no matter if you're at home or not. Windows 7 Clean Install - Step 32 of 34. You don't need to do anything here. Everything is automatic. If Windows 7 detects another computer on your network running Windows 7 that also has a homegroup set up, you will be prompted to choose what kinds of files you'd like to share on that homegroup and for the homegroup password. You can enter this information or Skip the setup entirely. Windows 7 Clean Install - Step 33 of 34. Windows 7 will now put all the "finishing touches" on your clean installation like adding icons to the desktop, prepare the start menu, etc. You don't need to do anything here. All of these changes are done automatically in the background. Windows 7 Clean Install - Step 34 of 34. If you chose not to enable automatic updates (Step 29), then the first step after installing Windows 7 is to visit Windows Update and install all the important service packs and patches that have been issued since the version of Windows 7 on your DVD was released.